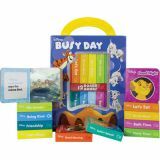 Little ones love to laugh and learn along with their favorite characters! 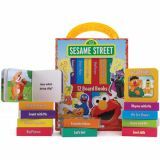 Chunky little board books feature early learning concepts such as counting, colors, rhymes, shapes, and more. Set of 12 books in a convenient carry-case. 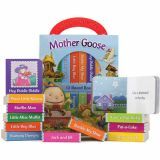 Introduce your child to 12 classic Mother Goose nursery rhymes with this first library of sturdy board books sized perfectly for little hands. 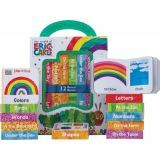 Sweet and colorful illustrations bring each rhyme to life—you and your little one will love using the box and convenient handle to carry them with you everywhere you go! Read and relive treasured tales like “Jack and Jill,” “Rock-a-Bye, Baby,” “Little Boy Blue,” and “Humpty Dumpty” today!